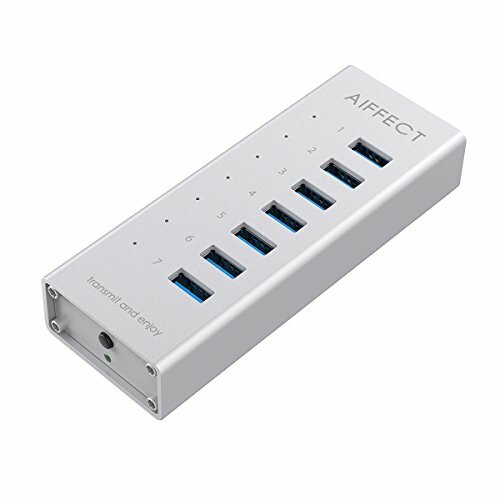 AIFFECT 7 Port 3.0 USB HUB helps you to expand one USB 3.0 port into seven, works great with your laptops, tablets, especially perfect for notebooks which come with only a few ports in an era when you need to attach many USB devices at once, such as a mouse, keyboard, card reader, cell phone or thumb drive, ect. AIFFECT USB 3.0 HUB provides you a high data transfer rates of up to 5Gbps, 10x faster than USB2.0 and allows users to add 7 USB3.0 ports for your computer easily, backward compatible with USB2.0 and 1.1. With power adapter, support BC1.2 charging. Build-in Overvoltage/Overcurrent/Leakage and Short-Circuit protection unit can keep your devices from damage. Besides, Simple and elegant, delicate aluminum surface texture, it is the wise choice to show your taste, this hub is perfectly matched with iMac, MacBook Air, MacBook Pro, MacBook, PCs and laptops, it is sleek yet durable and serves a long working life. 2.4Ghz wireless devices, such as wireless keyboard and mouse adapters, may not work in close proximity to USB 3.0 devices or hubs. Connecting to a USB 2.0 port is recommended. External hard-drives should be connected with the power adapter. If not connect with power adapter, devices connected to this Hub must not exceed a combined current of 5 volts 900 mAh. We provide long warranty up to 18 months and free lifetime technical support. Well Designed: With delicate sleek aluminum durable and can be a elegant decoration on your desk. Huge Expansion: Enjoy super-fast transfer rates of up to 5Gbps for up to 7 devices-simultaneously! SuperSpeed Charging and Transmission: Support BC 1.2 charging, with power adapter and soft blue LED data transfer indicator ensures stable data transfer. Excellent Performance, Safety Guarantee: Works flawlessly on Windows XP/Vista/7/8/10 and Mac, it is certified by CE, FCC. What You Get: AIFFECY USB3.0 7-Port Hub, DC 12V /2A power adapter, 3.3Ft USB 3.0 cable and 18-month hassle-free warranty. If you have any questions about this product by AIFFECT, contact us by completing and submitting the form below. If you are looking for a specif part number, please include it with your message.